HandKrafted by Stephanie: Verve Project Parade - "A Kid at Heart"
Verve Project Parade - "A Kid at Heart"
This is my final project for Verve Stamps as one of their January guest designers. I wanted to take this opportunity to thank Julee again for the wonderful opportunity. It was an honor to be asked, and I had a great time playing along with all the Divas! Now on to my project ... beware - this is a lengthy post! Verve's Project Parade is currently winding down, but you still have time to participate for a chance to win $25 to spend in the Verve store. Even if you don't play along, you won't want to miss some of the great creations HERE. When Diva Jen first issued the "A Kid at Heart" project challenge, my first thought was of playing cards. My DH has such fond memories playing cards with his dad at a very young age (he says he started around ages 2-3). They started out with "War" and "Slap Jack" and by the age of 8, Dan was a card shark, playing real adult card games like Pinochle and Bridge. While I enjoy playing cards for fun, he's a little too intense of a card player for my taste. Enter Sabrina, our DD who is 5 1/2 now. She has just started to play cards with him, and she seems to enjoy it. That is "their" thing to do together. So, even though we have numerous decks of cards around our house, I decided to make a special set of cards just for them. Instead of the traditional decks with clubs, hearts, diamond and spades, I used Verve's "Hearts on Fire" and "Hundred Hearts" to create an all heart deck. To begin with, I downloaded the Hoyle playing cards font (a free download available from many online font sites) and created Word text boxes to print the basic parts of the cards. After consulting with DH again, I learned that there actually is an official four-color deck created by a professional poker player. The colors are red = hearts, black = spades, green = diamonds and blue = spades. I adopted the same colors for my deck, but I used only hearts. My playing cards are what I found to be the standard size - 2.5" x 3.5". I started with a white cardstock base. After printing the official Hoyle numbers and letters in the upper and lower corners, I stamped the small heart from "Hearts on Fire" under each. Next, I carefully measured where the center point of each heart should be and lightly marked each spot with a pencil so that I had a better idea of where the heart should be. 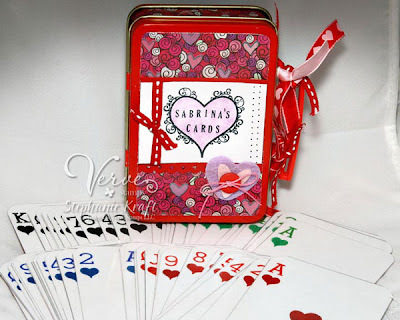 Then, I used the slightly larger heart from "Hundred Hearts" to stamp the corresponding number of hearts onto each card. For the face cards, I downloaded images and sized them accordingly. I then carefully drew lines around each image with a black pen. I finished off the back of each card with a shimmery pattered paper, ran each card through my Xyron laminator, then I rounded the corners. 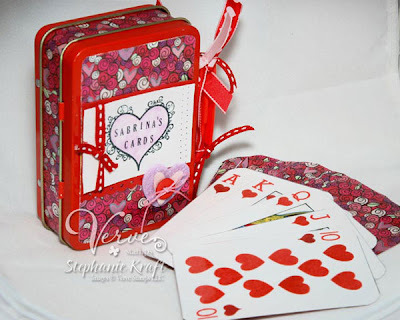 Once I finished my cards, I moved on to altering a small lunchbox tin which previously held Cherry Sours (yum!). I removed the hardware so that I could more easily decorate the box. I decorated the cover using the large open heart from "Hearts on Fire", then I stamped the words with my tiny Karen Foster snap alphabet stamps. 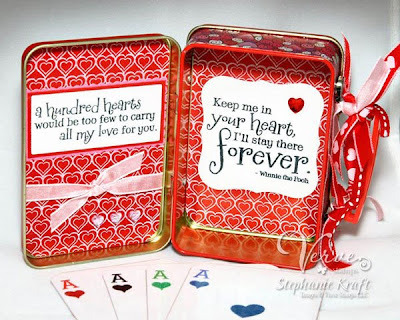 The insides of the tin are finished off with 2 of my favorite quotes from "Hundred Hearts" atop a stamped background of the tiny heart border from the same set. Rhinestones and ribbon finish it off. Now Sabrina has a special deck of cards to play card games with her Daddy! A couple of project notes: If I ever make a deck of cards again, the next time 1) I will try to use a patterned paper with a solid white background that is thick enough so that the ink doesn't bleed through the patterned side OR 2) I will use copy paper. My deck is VERY thick! 3) Before I start laminating my cards, I will check to make sure that I have an extra lamination roll. Accessories: Sticker machine, laminating cartridge (Xyron), Round-it-all (Zutter), black archival pen (Sakura). Accessories: Long Rectangles and Labels One Nestabilities (Spellbinders), Cuttlebug (Provo Craft), Markers (Copic), tiny hearts border punch (Martha Stewart), Sticker machine, laminating cartridge (Xyron), lunchbox tin (Target), felt hearts (American Crafts), 3/8" ribbon and rhinestones (Martha Stewart), 1/4" ribbon, button, waxy flax, paper piercer. This is darling Stephanie! What a great idea! I am sure your daughter loved it! STEPH!! This is absolutely AMAZING!! I am totally in love with this project - what a fun and creative idea!!! I LOVE it when projects are beautiful AND practical and it sounds like this one will be put to good use at your house!! You've done such a great job with all of your projects this release, but this one really takes the cake!! I'm so glad I got this opportunity to discover your blog and sort of "meet" you!! All of your work is amazing!! !